Like most parents, I like to treat my kids: occasional movies, ice cream, the candy shop, that kind of stuff. I also like to emphasize the value of a dollar and encourage moderation. So how do you do both at the same time? Set a quick budget for the outing. No tedious haggling, or the deal is off! Parent covers the budgeted amount. Spend more? Kid picks up the difference. Spend less? Kid pockets the remainder. Simple. Effective. Even educational. The experience invariably leads to interesting discussions about things like comparison shopping, impulse buys, buyer’s remorse, pricing, relative value, marketing, etc. 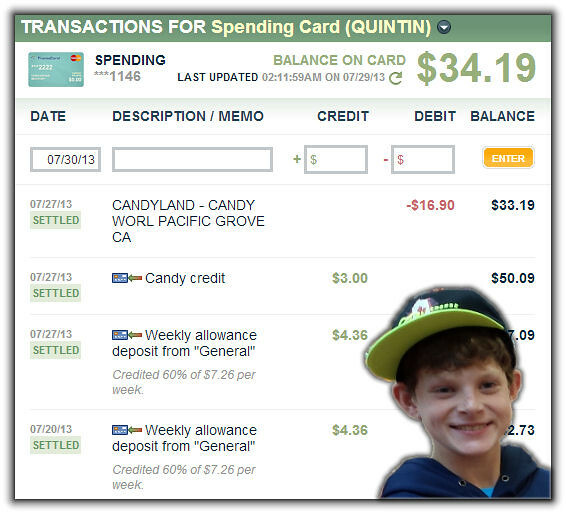 By the way, having a family pack of prepaid cards, makes the process really convenient. Before making the purchase, just advance the budgeted amount with an instant transfer from your parent funding card to your child’s spending card. (The mobile interface is handy for this when you’re already on the go or even in the shop already.) Then have your child complete the purchase. That’s it. No messing with getting cash or manually recording the purchase. 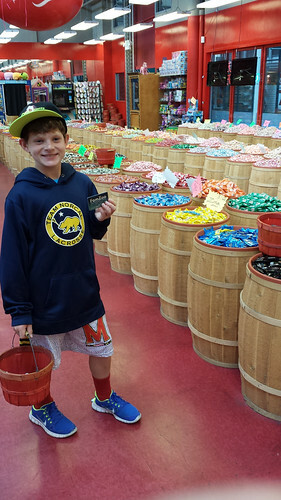 Here’s my son holding his spending card freshly loaded up with my $3 candy advance. Here’s a list of his transactions after the purchase. $16.90. Ouch! 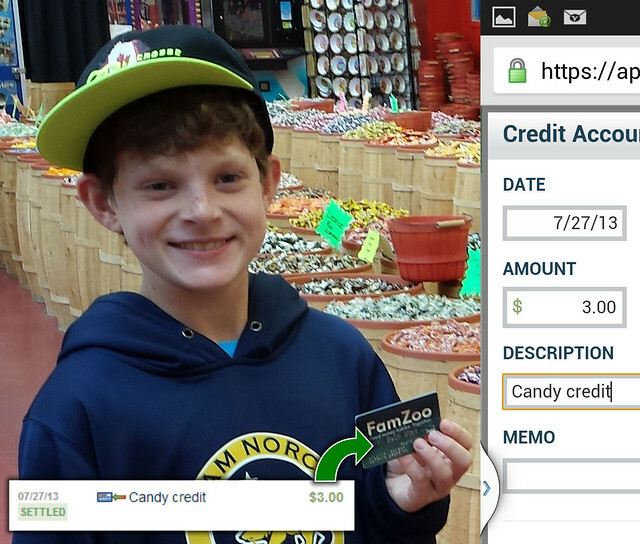 I forgot to mention a nice follow-on experience to the candy budgeting debacle above. You may be thinking that having my child overshoot the candy budget by $13.90 was a huge parenting financial fail on my part - perhaps. But a couple weeks later, we visited Disneyland and I conducted a similar exercise with a $20 souvenir budget. How much did he spend this time? Zero dollars. Nada. The candy store experience had been weighing on his mind and he decided he'd rather forgo the souvenir to (more than) restore the money he had blown on candy a couple weeks before. Lesson learned.